When it comes to dessert, I am always a cheesecake-first gal. My taste buds are fiercely loyal to that smooth, creamy, cream cheese filling, and they usually refuse to be swayed in any other direction. Running a close second to cheesecake is anything topped with crumbs. Dutch Apple Pie and Crumb Cake rank right up there at the top of my sweets food chain. If I can’t eat cheesecake or chocolate, you better believe I’m going after a crumb topping! So it’s no surprise that when I came across a recipe that combined a cream cheese filling with a crumb topping, I was nearly salivating. Throw in a tart crust, fresh strawberries, and virtually no bake time, and you have the epitome of what summertime desserts should be. This recipe requires some planning ahead, as the tart crust needs to be made ahead and refrigerated before baking, but it is well worth the effort. I can say with 100% certainty that if I did not have anyone else to share this with, I could easily demolish this tart within 2 days. I have no self control when it comes to wonderfully creamy, fresh, and crumb-y desserts. I would have had the same issue with the no-bake banana split dessert from a few weeks back. It’s good for my wallet that I have willing and eager taste testers, or else I would be replacing my wardrobe every 2 months. 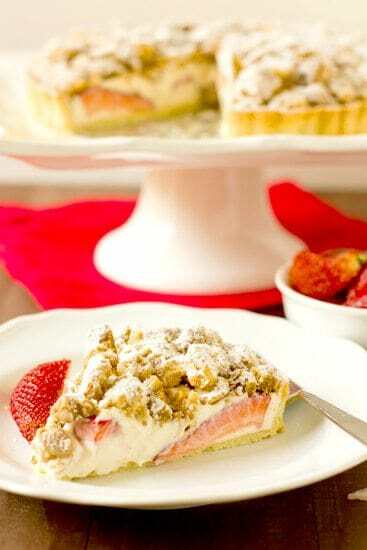 This tart is highly adaptable depending on the season and your personal tastes. You could easily replace the strawberries with raspberries, blueberries, or blackberries, or do a mixed berry version. In addition, fresh chopped peaches or mangoes would work wonderfully as well. Don’t you just love when you can play around with flavors and what’s in season? Make the Tart Crust: Combine the almonds and powdered sugar in the bowl of a food processor and pulse repeatedly until finely ground, about 1 minute. Add the flour and salt and pulse a couple of times to mix. Add the butter and pulse again repeatedly until no visible pieces of butter remain (about 10 pulses). Add the yolks and vanilla and continue pulsing until the dough forms a ball. Turn the dough out onto a floured surface, shape into a thick disk, and wrap in plastic wrap. Refrigerate until firm, at least 1 hour. When ready to bake, arrange the racks in the upper third and lower third of the oven. Preheat the oven to 350 degrees F. Line a baking sheet with parchment paper or a silicone baking mat; set aside. Make the Crumb Topping: In a medium mixing bowl, whisk together the flour, sugar, baking powder, cinnamon and salt. Stir in the chopped almonds. Use a rubber spatula to stir in the butter until all of the dry ingredients have been evenly moistened. Let the mixture stand for 5 minutes, then use your fingertips to break the mixture into ¼- to ½-inch crumbs. Scatter the crumbs on the prepared pan. 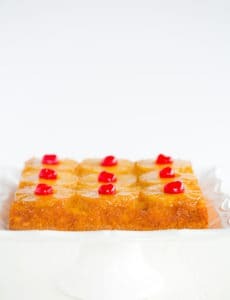 Remove the tart pan from the refrigerator, and remove the plastic wrap. 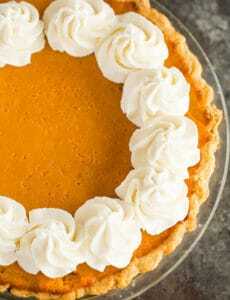 Line with a piece of parchment paper and fill the pan with pie weights. 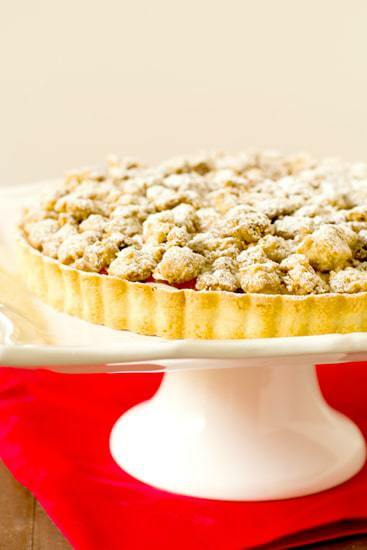 Bake the tart crust in the lower third of the oven and the crumb topping in the upper third. 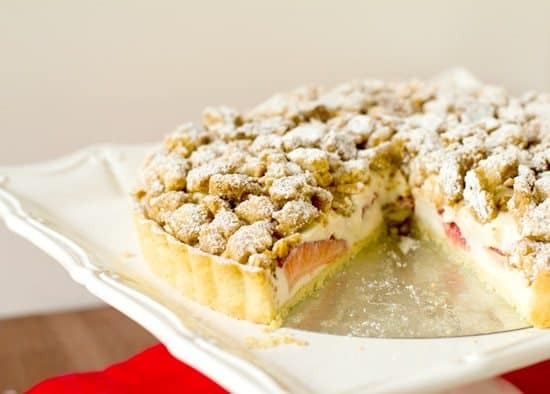 After 10 minutes, remove the paper and pie weights from the tart shell and place it on the upper rack, and move the crumbs to the lower rack. Continue baking the tart shell until it is dry and light golden, 15 to 20 additional minutes. Bake the crumb topping until it is deep golden and firm, 10 to 15 additional minutes. (Check the crumbs around the 10 minute mark and then go from there - my crumbs were done around 10 minutes, and the tart crust around 20 minutes.) Cool the crust and the topping on wire racks. 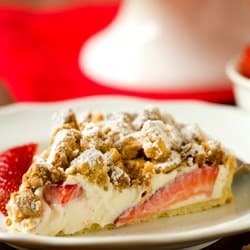 Assemble the Tart: Spread half the cream cheese filling on the bottom of the tart crust and arrange the sliced strawberries on it, cut side down. Spread the remaining filling over the strawberries. Evenly scatter the crumb topping over the filling. 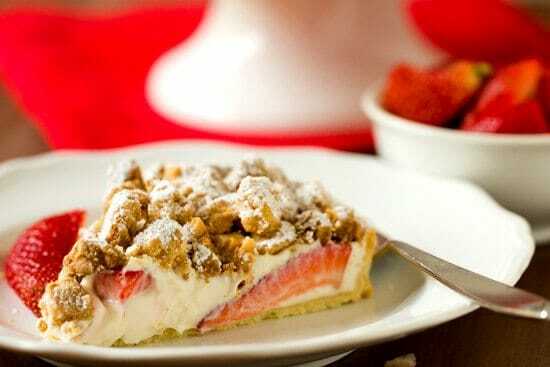 Right before serving, lightly dust the topping with powdered sugar and garnish with additional strawberries, if desired. Unmold the tart from the pan and place it on a platter. Wrap and refrigerate leftovers. I’m in New Zealand and strawberries are in season! I can’t wait to make this for Christmas! Question though – I only have a 8 x 11.5in size tart pan, not a round one. Do you think I need to make any changes? Have a great holiday! Hi Nat, Your pan likely has less surface area, so you may need to cut the recipe by about 1/3 or 1/2. Hi! i was wondering if I could use almond meal instead of the slivers? Hi Linda, I would not use almond meal; the slivers are meant to give crunch and texture to the topping on the tart; almond meal (which is more like a flour) would not accomplish that goal. 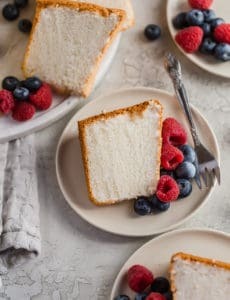 I just wanted to say thank you for the recipe and inspiration for this wonderful dessert. I made a version of it and it’s on my blog now. Absolutely delicious!